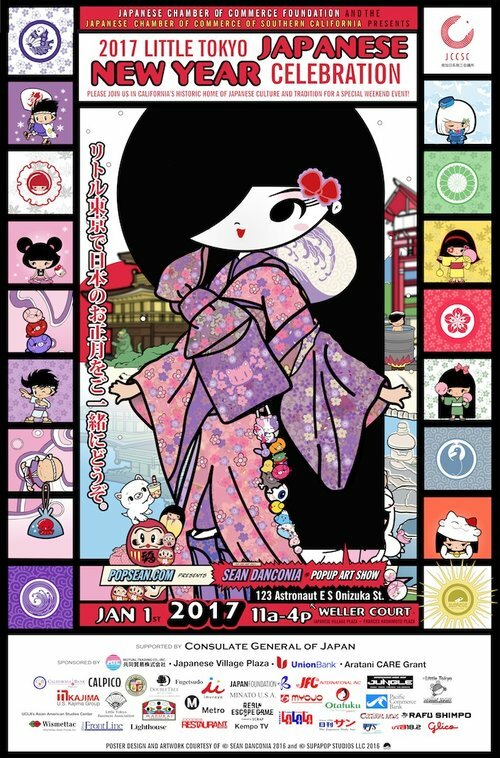 SupaPop Studios and the marvelous mascots of SupaPop City are proud to be sponsoring The Japanese Chamber of Commerce Foundation and Japanese Chamber of Commerce of Southern California as they host their 19th annual “Oshogatsu in Little Tokyo”on January 1, 2017. This event was started in 1998 to introduce members of the Japanese American community and the general American public to the wonderful traditions of the New Year Celebration in Japan. In conjunction with many different community organizations, the JCCAC has already started working hard to make 2017 the very best Oshogatsu event ever!!!! Free SupaPop stickers will be made available on a first come, first serve basis. In addition, the souvenir program guide will also be given away featuring art from the official poster designed by Sean Danconia. Check it out in and around around Little Tokyo. The event will begin on Jan. 1st at 11am and end at 4pm. Location is Weller Court in Little Tokyo located at 123 Astronaut E S Onizuka St, Los Angeles, California 90012.